Such stress can gradually create problems occurring within the feet, leading to an imbalance in one’s gait pattern (the way one walks) and excessive pressure on certain areas of the feet. These changes may lead to pain and discomfort and osteopathic treatment is not only effective in treating symptoms and relieving pain but also addressing the structural causes contributing to the problem. Here at Taylor & Conroy Osteopathic and Sports Injuries Clinic, orthotics (customised prescription insoles) are available. They can be used for specific problems or provide comfort and ease the stress placed on the feet. A consultation involves a structural assessment of the body (not just the feet), as well as the use of exclusive laser scanning technology to create a more accurate, highly effective orthotic. 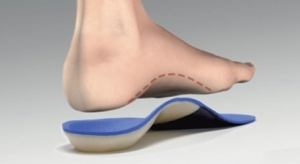 The orthotics here at Taylor & Conroy Osteopathic and Sports Injuries Clinic are designed to suit the individual, considering their structural needs, lifestyle and level of activity. Products are Irish Medicines Board registered.